From Route 95 North, take exit 12 (exit 12A from Route 95 South) to Route 113 East. This is Main Avenue. Continue East past the airport until 113 ends at West Shore Road (Route 117), about 3 miles. Turn left onto 117. Go about 1/4 mile to the first traffic light and turn left onto Sandy Lane. The library will be on the right, about one mile. 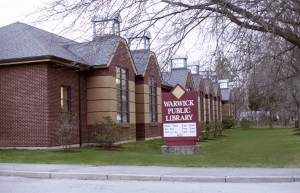 Warwick Public Library is the hub of community learning where every child can be a reader; every resident can connect to the digital world; and every life is enriched by lifelong learning.